Where quality control counts and response time matters. 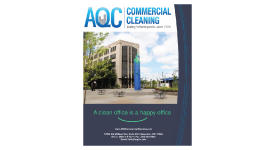 AQC is Portland’s local, full-service, Commercial Cleaning Company that has been servicing the Greater West-Side and Portland Metro area since 1994. Our services include routine janitorial services, floor care & maintenance, carpet & upholstery cleaning, window cleaning, pressure washing including graffiti removal and much much more. We provide cleaning and janitorial services to the following industries: Office, Medical & Dental, Banking, Government, Industrial, Movie Sets, and Retail. AQC is trained and equipped to service any size building or facility from under 5,000 sf to over 200,000 sf with ease and precision. Experts cleaning Class A, B, and C office space, remote Medical, Dental, and Chiropractic Clinics, andBanking Facilities. Monthly Inventory Services provided – Complimentary – whether you order your building supplies from us or not. We offer contracted Portland commercial cleaning services. Employees are thoroughly screened, professionally trained and qualified for 90 days before they become part of our “team”. They wear company uniforms, ID badges, and recieve ongoing training after they become an AQC Cleaning Technician.